Besides quinine, numerous others agricultural produce was grown. Here are some examples. Rubber or Hevea, comes from latex, the juice from the rubbertree. The latex is bled from the tree by making incisions in the bark. On the latest point of this tap a spout is introduced so that the latex flows into cups. These cups are gathered regularly in buckets. These buckets are taken to the rubber factory or a gathering station in the forest. There has been much experimentation with the tapping methods. The key was to achieve a balance between yearly productivity and the time required for the bark to recover. 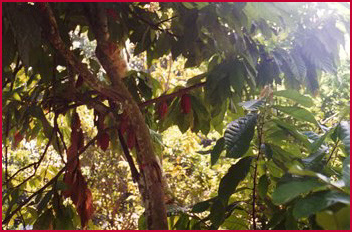 Lauracea: You can clearly see the cinamon sticks haning in the cinamon tree. Rubriace: the Coffee trip. It is possible to the see the beans. Through a process of fermentation the meat of the fruit is separated from the beans. These are then dried. 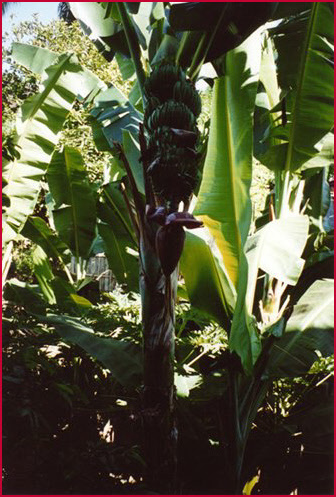 Musa: There are many tipes of bananas in Indonesia. This is the Pisang Susu, a small and extremely sweet variety. .
Camelia Sinensis: Sinensis is Latin for Chinese. 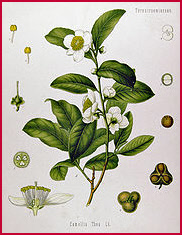 The tea-plant, which came originally from South-East Asia, is an ever green bush or small tree. It can grow upto 17 meters, but is usually cut at two meters to facilitate the harvest of the leaves. These days tea is grown across the world in tropical and sub-tropical climats.